Spending the last six years in the Middle East has imbedded in me a never-ending desire to locate any sort of nature or greenery to feed my soul; however small the green bit is. But in the last few years, my desperation has taken on new heights, and I’ve started to employ various satellite mapping programs to help in my quest. I first started this in Kuwait, where, much to my husband’s amusement, I repeatedly fell prey to some misleading labels that designated something as “green,” “garden,” or “park.” The two most egregious were the “Nature Reserve” which turned out to be a fenced-in area of sand covered in trash along the Gulf coast, and the “Japanese Garden” which turned out to actually be a “Remediated Soil Park,” which seemed to imply some sort of contamination clean-up. 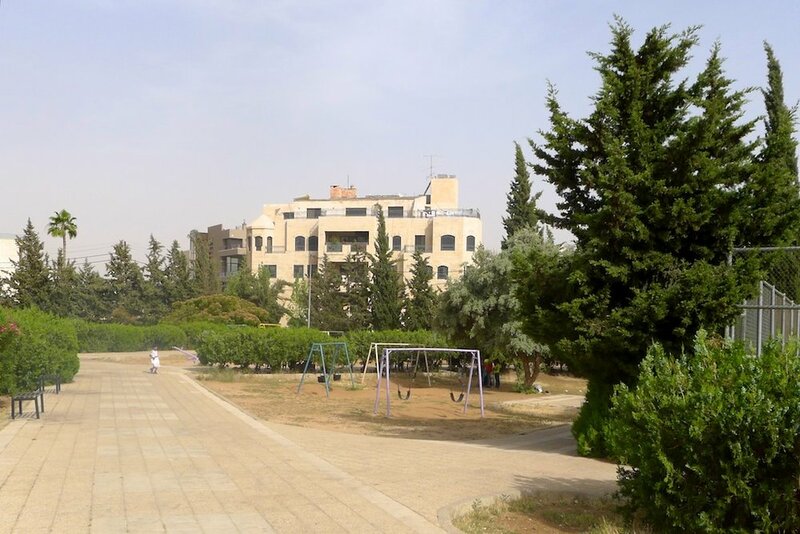 Housing Bank Park – located in Abdoun, across from Fitness First Gym (GPS: 31°56'26"N 35°53'1"E); sandy, quite clean, well-maintained equipment, swings and slides and climbing gear, paths and nicely landscaped. The only negatives are the lack of shade, the popularity which can lead to masses of children, and the weird hours (sometimes locked around 5:00pm and randomly shut on weekends and holidays). Al Diyar Park – located in Abdoun, behind the small Cozmo off Saad Zaghloul (GPS: 31°56'54"N 35°52'43"E); small playground with swings and slides, relatively clean sand, and a fenced in area good for tricycles, soccer practice, running loose, etc. Salah al Deen Park – located a few blocks from 4th circle, next to the Salah al Deen Mosque (GPS: 31°57'19"N 35°53'35"E); a small quiet park with a few swings and see-saws, mostly paths and bushes and a run-down tennis court. Zahran Garden – located off Zahran Street, between 4th and 3rd circles, across from HRH Queen Zain Al-Sharaf Al Hashmi Palace (GPS: 31°57'15"N 35°54'7"E); small with no playground equipment, but walled-in and relatively secure to let little ones explore on nicely landscaped paths. Orthodox Club – located one block from Abdoun circle (GPS: 31°56'51"N 35°53'47"E); costs 2JD per child to use the playground (adults are free), but the facilities are nice and shaded, with relatively clean sand and lots of climbing and swinging equipment (most in working order). Do note that if you are not a member of the Orthodox Club then you can only visit during the week, not on weekends. Amman Martyrs Park – located off al Hashimiyeen Street (GPS: 31°56'38"N 35°52'20"E); sandy and sunny playground with swings and slides and nicely landscaped paths to explore. Al-Hussein Sports City– located off Al Shaheed Street (GPS: 31°58'57"N 35°54'5"E); free entry, can rent old bicycles here or just bring your own, very popular and crowded on weekends, but still fun to explore the wooded trails and paths (though you’ll enjoy it a lot more if you can figure out how to ignore the endless sea of plastic bags and trash everywhere). King Abdullah Gardens – located at the intersection of Kindi and Arar Streets; apparently this used to be the site of a small amusement park, but is currently mostly home to concrete block buildings housing car rental companies and a derelict cable car system (don’t fall prey to the misleading greenery on various online maps). King Hussein Gardens – located adjacent to the Children’s Museum (GPS: 31°59'9"N 35°49'41"E); this, by far, has been the biggest disappointment in my quest for green spots. It’s an enormous complex and considering it’s located next to several very popular destinations, the Children’s Museum and the Royal Automobile Museum, I went with rather high hopes. Within minutes, these were quickly and resolutely dashed. The grounds were littered with trash and cigarette butts and the few playground areas I passed by were dilapidated and potentially dangerous, with jagged metal edges and missing bolts. It’s still very popular on the weekends with families crowding around the trees for picnics, but until I hear of a massive clean-up and overhaul, I don't think I'll be returning. This is hardly an exhaustive list, but it’s a good start for anyone else who feels the need for a quest for a green spot.